Over the summer I’d stop at the local traveling farmer’s market in my town. It comes through every Thursday through the summer, and I look for the sign every week (as I can’t remember when it starts back up. May, likely?!) on Thursdays when I take Charlie to school. My hope is that this summer the garden harvest is plentiful and I don’t have to buy as much produce from the market or store…leaving more wiggle room for these more expensive meats. But even with the more expensive meats, I will still apply the overall concept of $5 Dinners! In a large saucepan, brown the chorizo sausage with the crushed garlic and chopped onion. Drain and return to the saucepan. 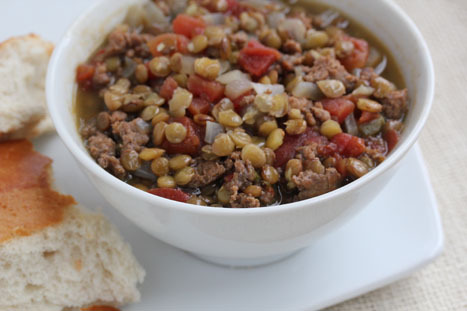 Add the broth, green lentils, Rotel diced tomatoes with green chilies and some crushed red pepper if you can take the heat! Bring to a rolling boil, then reduce heat and cook for about 20 minutes, or until the lentils have cooked. Season with salt and pepper to taste. Prepare frozen veggies or other side dish. Warm bread. 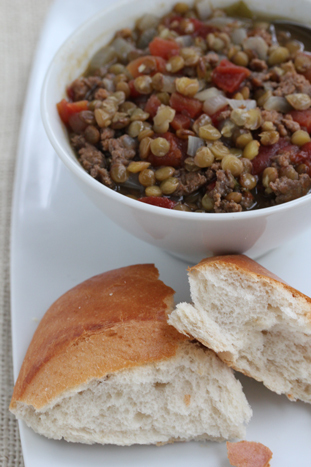 Serve Spicy Chorizo and Lentil Soup with veggies and/or bread. One of the keys to being able to afford the grass-feds and free-ranges, is to eat less of them by using the meat as more of a condiment rather than as the main. The above recipe is a great one for that, and you could probably still cut the amount of chorizo in half and not notice a difference. Another way to make something like free-range local chicken breast more affordable is to butterfly each breast half so that each serving is a half of a half. It’s still about a 30z serving and less is wasted. I’ve purchased locally grown meats for so long now (even when on food stamps) that my conscience prevents me from purchasing the “industrial” stuff. This looks good! I’m definitely going to try it. Sometimes, I can find ground pork for much better prices than sausage. If that is the case for you, you can season your own sausage very easily. Just google for recipes. It helps to make it in the morning, then let it sit all day for the flavors to develop, but it’s fine if you do it right at supper-time, too. This is one way we’re able to have a variety of sausages, with the cheaper ground pork price. I think I am going to make this today. I’ve never cooked lentils. Do I need to presoak them like white beans? Thanks.